A couple years ago, Mozilla published an add-on tool called Collusion for monitoring which websites were tracking your movements around the Internet. A follow-on app named Lightbeam, with even greater power, has been released: "Shining a spotlight on online data tracking to help people understand the Web around them." As with Collusion, Lightbeam gives you a picture of all the websites that are notified of your presence on your targeted website. For instance, when you evaluate RF Cafe using Lightbeam (click thumbnail to left), you will discover that Google and DoubleClick (a Google subsidiary) are notified in order to serve pay-per-click banner advertisements. I depend on them to generate revenue for putting food on my table and a roof over my head. To be honest, I have no idea what happens after Google checks in, other than being fairly confident that the NSA is also notified as they are for every click, e-mail, or phone call you make anywhere, anytime. If you have noticed how long websites take to load, it is due primarily to waiting for all the third-party ads to be served, although the quantity and file size of images also factor heavily. Go to a website (or refresh the one you're on) and watch how long it takes until the little spinning thingy at the top to finally stops spinning to see how much time the page really takes to completely load. RF Cafe is typically much faster than the majority of engineering websites because I minimize the use of third-party ads, and then reject ones with videos since they are the worst offenders. If I see a stupid Google Ad appear on RF Cafe, I use my account settings to block the company's ads. A lot get through anyway since new companies appear all the time, but at least I make an effort at keeping you from suffering online dating and political type ads, among others. BTW, those are usually the highest paying ad types, so I willingly sacrifice that revenue to spare you the annoyance. Mozilla claims there is a lot of analytical power available in Lightbeam, so if you are really interested in digging into the Internet's dark, spooky corners, this might be the place to start - just be careful what you uncover or you risk being visited in the middle of the night by government Ninjas in full battle gear. Three types of data displays are provided by Lightbeam. 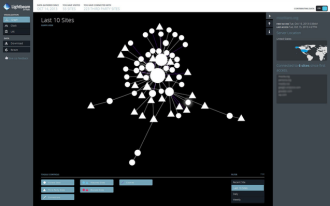 1) Graph view draws a picture of the 3rd-party connections emanating from the primary website. 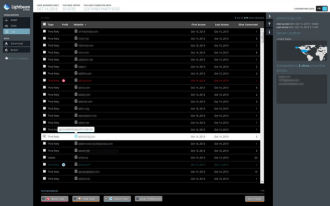 2) Clock view tracks your connections over time. 3) List view gives you the gory details of your connections - both intended and unintended. Below are screen captures of a lot of the websites I visit every day to collect worthwhile technical headlines. In most cases, the length of time it takes a web page to load is nearly proportional to how many connections you see. Note that the IEEE USA website has no 3rd-party connections since it has no advertisements other than its own. Accordingly IEEEUSA.org loads very quickly. On the other hand, CNN Tech and Fox News Science pages take a much longer time to completely load. If any page happens to host an ad with video in it, expect to wait even longer. As stated in the past, I make an attempt to not post links to any web page that starts playing a video of any sort without your permission. To get a useful metric of web page loading times, try the Pingdom Website Speed Test utility (free).